While we like to think that Christmas trees go to a better place when they’re done filling us with the holiday spirit, the truth is that they either sit on sidewalks rotting or end up in the chipper (it’s not pretty). But there are a lucky, select group of trees that end up at the studios of et al. Collaborative, who repurpose them as awesome rustic lamps. The pieces are organic, minimalist, and have the simple charm of a tree trunk adorned by a single lightbulb. During the process, most of the branches are carefully stripped from the trunks, but even those are reused as mulch for a neighboring rooftop garden. While we like to think that Christmas trees go to a better place when they're done filling us with the holiday spirit, the truth is that they either sit on sidewalks rotting or end up in the chipper (it's not pretty). But there are a lucky, select group of trees that end up at the studios of et al. Collaborative, who repurpose them as awesome rustic lamps. 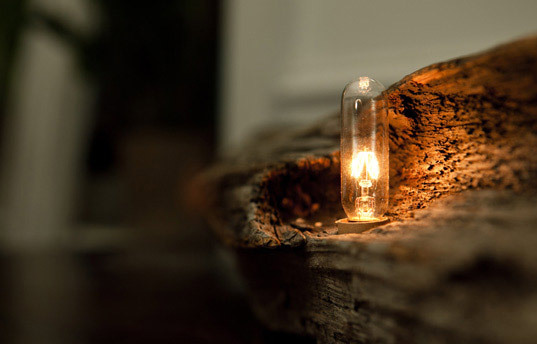 The pieces are organic, minimalist, and have the simple charm of a tree trunk adorned by a single lightbulb. During the process, most of the branches are carefully stripped from the trunks, but even those are reused as mulch for a neighboring rooftop garden.